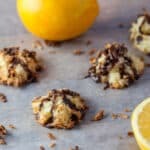 Absolutely delicious, unbelievably easy Coconut Ambrosia Vegan Macaroons! Ultra moist and fruity! These vegan macaroons are also Gluten Free! Mom’s Christmas present this year, (She loves them!) but not really a Christmas cookie. Good anytime of the year if you like Coconut! Prep is less than 10 minutes! I am very fond of citrus of any kind, but I am crazy about the flavor of oranges in baked goods! This Cranberry Orange Pumpkin Quick bread is amazing! And so easy! These Ambrosia Macaroons, on the other hand have orange and chocolate!! I mean really, what’s not to love! Chocolate and Orange are a marriage made in heaven!! The beauty of these, like I said, is that they only take 10 minutes to prepare! These vegan macaroons are perfect for Christmas time! We are all so busy this time of year! It always feels good to have several things done in one day! It’s just a great sense of accomplishment! If you are a coconut lover, like I am, you will love these little mouthfuls! These are so moist, they melt in your mouth! They freeze well, if well packed in air tight containers! These Ischeler’s Tortellettes are a fun Christmas treat, as well! I hope you like the post today for Ambrosia Vegan Macaroons! Gluten and lactose / dairy free treats for any occasion! Position rack in center of oven; preheat to 325°F. Line large rimmed baking sheets with parchment. Using electric mixer, beat margarine in large bowl until smooth. Add sugar and salt; beat until blended. Beat in orange peel, then eggs. Drop batter onto sheets by tablespoonfuls, spacing 1 1/2 inches apart. Bake macaroons, 1 sheet at a time, until golden on bottom and browned in spots, 25 to 30 minutes. (Slide parchment paper off of the sheets, if you need to use the sheet for the next batch.) Cool completely on sheets. Using fork, drizzle chocolate over macaroons. Dry on parchment sheets until chocolate is firm, at least 30 minutes. Can be store in the refrigerator for 2 or 3 days, or pack in airtight containers and freeze for up to one month. Grate rind of 1/2 orange. Juice the 1/2 orange. Melt margarine in small saucepan. Whisk in Cocoa powder, water, orange juice and orange rind. Add powdered sugar and whisk until smooth and the consistency of a melted chocolate. You can easily add a few more drops of water or orange juice if the glaze is too thick. Alternately, if the glaze is too thin, add tablespoons of powdered sugar at a time, until you achieve a good consistency. Thanks, Javier! I really appreciate your comment! These Ambrosia Macaroons are absolutely delicious! Try them out! Coconut is my weakness — and I love how you’ve added orange to these macaroons. Seriously yum! Absolutely my weakness too! I made these for my Mom for Christmas! She loved the addition of the orange! Thank you Lisa! 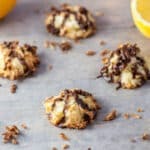 We love coconut but never tried macaroons, after looking at your recipe I am confident to make it. So easy and delicious, Also, vegan, lactose/dairy free and gluten free! Most importantly DELICIOUS! Thanks, Jagruti! These macaroons look so delicious! And I love the addition of orange juice and rind to boost the flavor!!! They really are super tasty! They are pretty strong with orange flavor, which I love! Thanks, Meredith! Mmm the flavor combo for these macaroons is perfect! I would eat about a dozen of these easily! It is difficult not to, Haley! I have to hide them in the freezer or there would be none left for Christmas! Thanks!! Oh these just scream Christmas. They would make a lovely little gift for someone too. Yes, I send some to Arizona because I have an Aunt there that is a coconut fiend, as I am! Thanks, Danni! Oh my gosh, these sound amazing! I have to try them!! They are super good! You won’t be sorry! Thanks so much, Kristen! I love anything with coconut, these look wonderful! Me too, Emily! They are definitely wonderful!! Your comment is greatly appreciated!! I love, love, love macaroons! My grandmother used to make the best cookies. I bet yours tastes just like hers! I can’t wait to make them as they are making me drool! Hehe! I know you will love these ones, Elaine! They are ultra moist and delicious! Thank you, my friend! I’m crazy for macaroons, these have all my favorite flavors, last time I tried to make some was a complete failure, will try your recipe Beth! These are so easy, Patty! There is no way this recipe will fail! Thank you my friend!